What is shown, and which actions are available. The sorting order can be changed by clicking on one of the column headers. Columns can be reordered by dragging with the left mouse button and shift down. Filtering can be activated by the View menu. 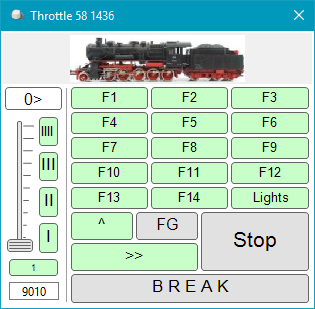 The ID, Image and Train fields can be used with Drag&Drop to set this loco in a block; Just click in one of those cells, drag it into a block and release the left mouse button to drop. The block will be cleared before if there was already another loco in the block. Loco ID which is set in the General tab of the Loco setup dialog. The interface address as defined in the Interface tab of the Loco setup dialog. Shows the block which the locomotive occupies. Overview of all modes a locomotive can be in. * Flagged for resume auto mode at next session. The next block which will be used as destination. The linked Train for this loco with the total length and weight in brackets. 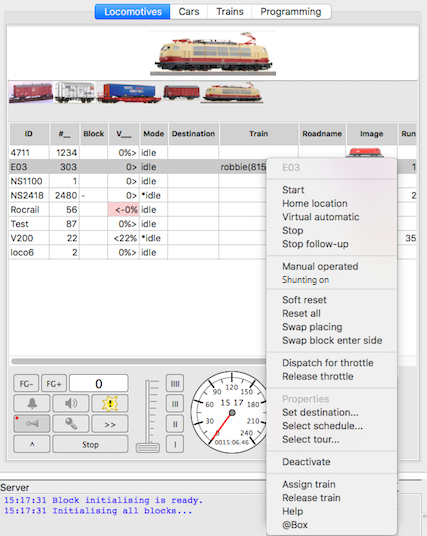 A train can be Assigned and Released with the Loco Tab Context menu. The total train length, including Consist members, is automatically calculated for use with blocks and routes. V is the locomotive velocity. When the number is prefixed with a minus sign means that the placing is swapped. Also the background of this cell will turn into red. ">" behind or "<" before the number denotes the set direction. With a double click on one of the locos grid cells, except for the ID, Image and Train column, a throttle control is launched: Loco throttle. For manual controlling a train. The function buttons may also be used in automatic mode. Those buttons changes the function buttons between function group F1-F4, F5-F8, F9-F12, F13-16, F17-F20, F21-F24, F25-F28 and F29-F32. All depends on the locomotive settings, Number of functions, and the capabilities of the connected Command Station. The F0 is in most systems used for the front/back lights of a locomotive. This will send speed zero to the selected loco. See the Loco Functions on how to set the button Icons. The optional SpeedOMeter can be activated in the Rocview preferences. Shows the actual Loco speed. Shows the Loco run time which is refreshed at every speed change. The scale is automatically selected depending on the Loco V_max. ; 120 or 240kmh. Starts or stops the automatic mode for this loco. It will reset the block wait time. it will overwrite the minimal occupancy in locations just once. Runs to a defined destination. Runs a Schedule or a Tour. Stops the schedule or tour recycle or follow-up. Switch between automatic and half automatic mode. This setting will stay active for the current Rocrail session. Reset all, except for the current block and schedule, for the selected locomotive. Reset all, including the current block and schedule, of the selected locomotive. Free a loco to make it available for an external throttle; See the manual of the used Command Station for details. Opens the Loco Properties dialog. See: Running to a defined destination. The Mode column of a deactivated loco shows hold on red background. A deactivated locomotive can not be started in automatic mode. Useful if a loco is in a block, but it should be prevented to start this loco by, e.g., start all locs or resume all locs. Removes the locomotive from the table. 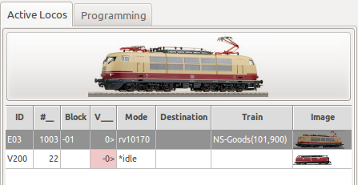 If you activate the option show the locomotive the loc is displayed again in the table. An operator can be selected to assign its train to this locomotive. The operator itself and the controller loco are not used in this context.